Geochemists can extract the water in the pores of the sediments in 2 ways. One way to access the pore water is remove a small section of the (whole round) core. A syringe is attached via a small hole in the container collects the pore water. A 5cm – 15cm piece of core is taken to the chemistry lab, where it is put in a titanium container and sealed with a fitted piston. The container is then placed on a hydraulic press called a “squeezer”. The sample is pressed under up to 35,000 lbs to extract the pore water. This process can take 5 minutes or several hours depending on the consistency of the sediment – soft muddy samples give up their pore water faster than harder samples. 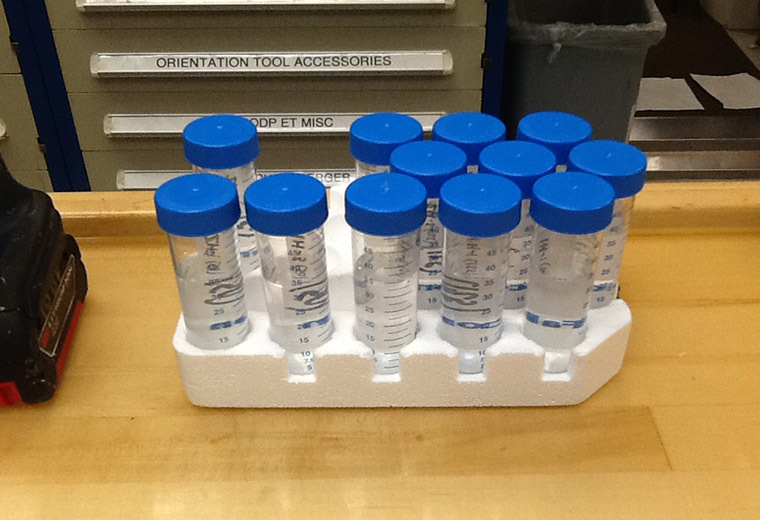 Once the pore water has been collected it is ready for testing. The pore water is tested to determine the pH and alkalinity, as well as several other different tests to determine the abundances of different elements and ions in the water. Squeeze Cake: small piece of whole round core after pore water has been extracted. So after the pore water has been collected, what happens to the squeeze cake? Different scientists request portions of the cake, to be taken back to their labs for testing. Sometimes pieces of the cake are used for analyses on the ship, which can include inorganic carbon and total carbon. Squeezing destroys the sediment structure, which means important parts of the core should not be used to extract pore water in this manner. Examples of important core sections include sedimentary boundaries (geological time periods) or major fault features. The alternative to cutting off a piece of the core to obtain pore water is to collect the water using Rhizon sampling method. The first step in collecting the pore water using the Rhizon method is to drill small holes along the core. Next a 10cc syringe is attached to each hole and the pore water is drawn into the syringe. A filter on the end of the extraction syringe separate s impurities from the water. The advantage of using rhizons sampling method is that the core stays intact and it is possible to collect several pore water samples at the same time without disturbing the sediment structures. Peter drills holes in the cores to prepare for Rhizon sampling. Syringes creates a vacuum and fills with pore water. The pore water from cores taken deeper into the ocean floor gives us distinct trends and changes in past environments, which we can measure using chemistry. Changes in biological, geological, and hydrological activities can be used to compare local seawater to past seawater. Thus comparing past oceans to current oceans.